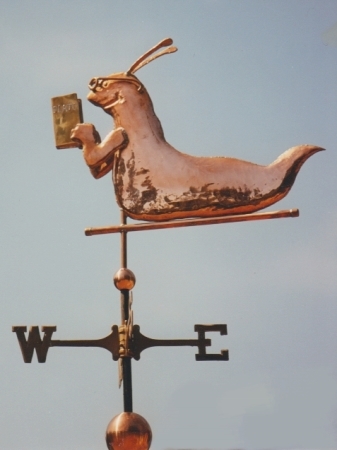 This particular weathervane does double duty as both a Bookworm and a Banana Slug, the official mascot for the University of California, Santa Cruz. 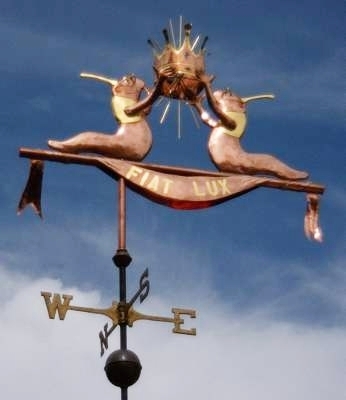 Both Ken and LizAnne, the owners of West Coast Weather Vanes, are UCSC graduates and hold a warm spot in their hearts for their alma mater. 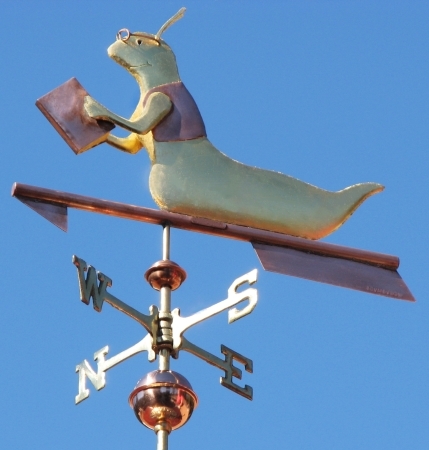 As active alums, they donated a Banana Slug Weathervane to the university as part of their ten year reunion contribution. It is now proudly displayed in the Chancellor’s garden, overlooking the beautiful Monterey Bay. Fellow alum, Matt Fitt, www.mattfitt.com, took some wonderful photos at sunrise and the Chancellor used one of the images for his 2006 holiday greeting card. Matt was gracious enough to allow us to reproduce his images here on our website. This single bookworm design has also been popular with UCSC graduates. One of our favorite stories is about a woman who supported her husband through his schooling while also raising their family. After their kids were more independent, it was her husband’s turn to support her in her scholastic pursuits as a re-entry student at UCSC. She loved going back to school and graduated with honors. 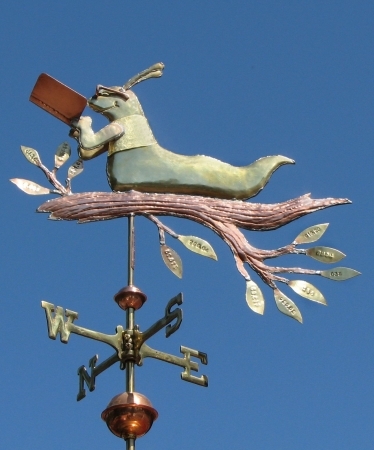 Upon her graduation, he presented her with a Banana Slug Weathervane to celebrate her achievement. 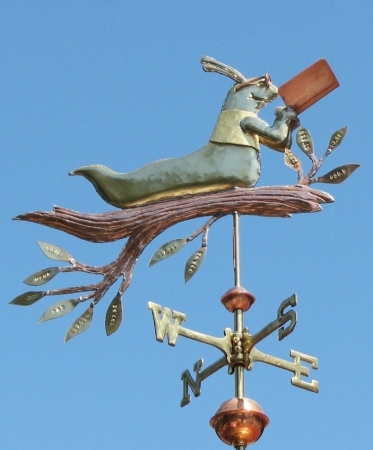 Another lovely story about this weathervane was the presentation of a small version of this design to a young woman who was the first in her family to graduate from college. It was given to her by her grandmother who was incredibly proud of her granddaughter’s accomplishment. Some customers have personalized this sculpture piece by placing their bookworm on all manner of bases, including the branch with leaves pictured above. Others have asked to have a hat and scarf added. One customer ordered a female representation of this piece. 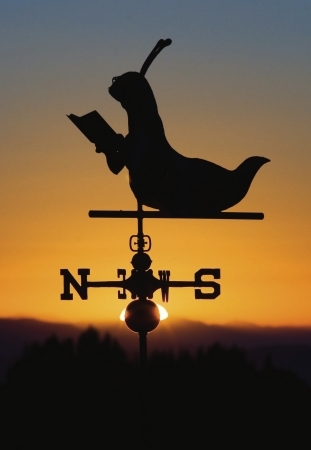 For bibliophiles, this weathervane can also serve as a Bookworm Weathervane. 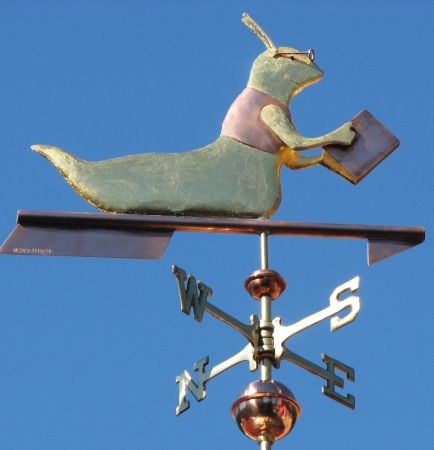 Because we make these weathervanes to order, we can even stamp the name of a favorite book onto the book jacket clasped in the bookworm’s hands or make the bookworm male or female. We have made versions of this design for public libraries, cozy garden settings, indoor displays and the tops of garages. 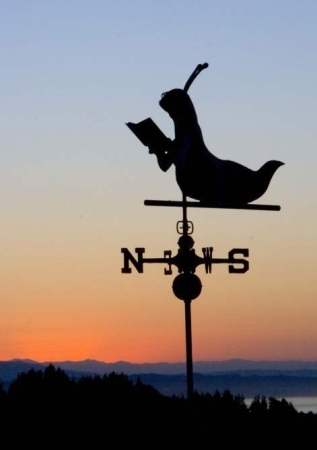 In one case, to celebrate the opening of a new library in Southern California, the mayor went up in a cherry picker and formally lowered the Bookworm Weathervane onto the new library as part of the opening ceremonies.